A Safe Work Method Statement (SWMS) is a written document that sets out the risk components of work activities being carried out at a workplace, the hazards and subsequent risks arising from these activities. SWMS look to support organisations by facilitating the measures to be put in place to control the identified risks within task performance. Its primary purpose is to help supervisors and workers implement and monitor the control measures established at the workplace to ensure “risky” work is carried out safely. Why do you need a SWMS? SWMS and are supportive of the details contained within the released documentation. How should you develop a SWMS? open consultation is enacted, and site specific hazards and controls can be developed. Particularly, SWMS must be able to take into account the circumstances at the workplace that may affect the way in which the work is being carried out, and provide clear directions as to the means of how a control measure is to be implemented. Assists in meeting legal requirements (risk management). Prices are tailored. Please contact us for a quote. Looking to write your own SWMS? 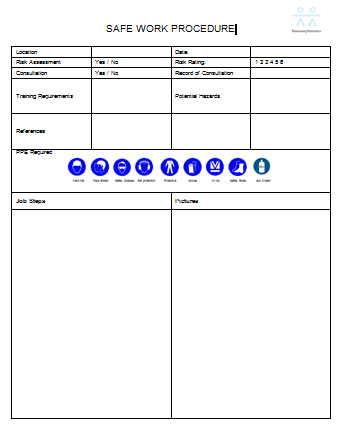 We're here to make it easier with a FREE Safe Work Procedure Template.